People always ask me is Jimmy Rosenberg Stochelo's brother? Are the Rosenberg trio all brothers? 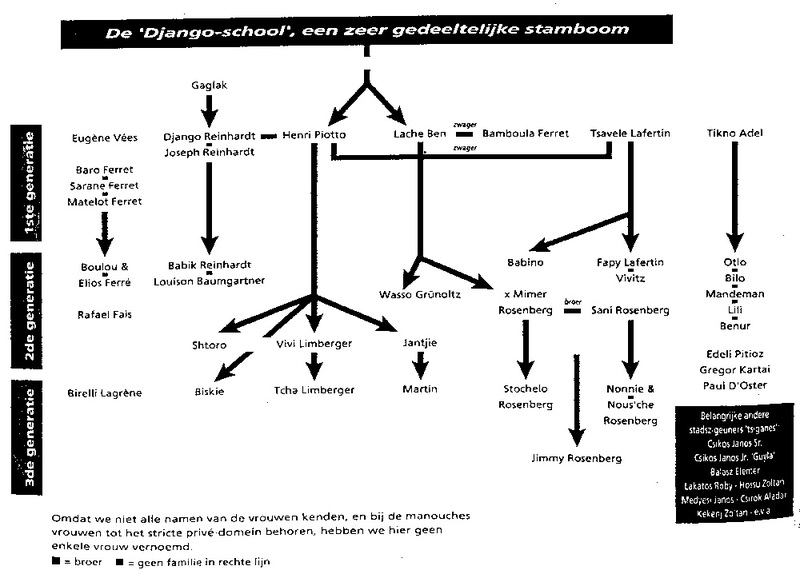 Is Bireli Lagrene Django's grandson?This chart, which was published in the Dutch Quintette news letter should help answer some of those questions. BTW, does anyone know the relation of Henri Piotto to Django? The chart has a line signifying some relationship. Maybe they where in-laws? I know that Henri played with Django some, but I never got the story on their familial relation. That would be an interesting project....if you'll run DjangoBooks for a year I'd be happy to go and do the research! I have the same question about Maurice Ferret - any relation to the Ferret Brothers? Btw, I am new to the forum (great site btw) and while I have always enjoyed this music never made a concerted effort to study the history or delve much beyond the Django recordings. But now I find myself deeply immersed in the music and looking for as much info as I can find. Well "working" maybe overrated but I have notes on that and I am constantly thinking of "school identification when I hear a new player. Like "who's in the steps of Matelo, who's in the steps of Tchan-Tchou, Stochelo, Benson, etc..."
People in France like to put a label on people, trends... etc. It's rather a default than a quality by the way. Anyway defining the "school" of a player can be simple if he had one or several teachers but at the end all musicians are fed with multiple influences. Also, being in Paris it's easier to identify these trends by seeing with whom the great players tend to play and hang out. Samois is good for that too regarding the foreign players. After we finished jamming last night on Lulu Swing, Steve Normandin asked me what relation Lulu Reinhardt is to Django, and I didn't know. Unfortunately, this genealogy does not answer that. Does anyone know? Lulo Reinhardt is said to be a grandnephew, but I can't find any biographical info on Lulu. This is a very confusing subject and seems to create more quesIn order to understand the familial relations non this music I think we need to take into account that gypsies tend to have large families and change names on as performers or other reasons. I met a man years ago named Olou Weiss who was another child of Django's father. How many others did Jean Weiss have? Was Eugene Vées (a French transliteration of Weiss); who was supposedly a cousin of Django's cousin, another son of Jean Weiss' or even a daughter? He had a son Mitsou who was an early teacher of Babik. Who were his descendants? Joseph had at least one child, a daughter who married Dingo Adel. Dingo (who played and recorded with Joseph Reinhardt) was alive and appears to be very health as of two or three years ago. How many kids did they have? Levis Adel Reinhardt is from this line and only adopted Reinhardt as he's etched out a career.. Django's first son Lousson had 15 children and from him comes Loumpie Baumgartner and Dallas. Some people have told me that Dallas is the son of one of Lousson's daughters or grand daughters. Others tell me that Dallas' mother married into the family and is not related at all. Other people have told me that he is Lousson's great-grandson. and Babik has three children that I know of. I've heard that he has upwards of 10 if not more kids. A young player based in Paris named Steven Reinhardt says he's Angelo's son. Several players in France have denied this. Angelo's wife's surname is Reinhardt. He even appears in video with Angelo's family at Django's grave. Is he related by birth or marriage. How many children did Django's sisters have? Tchavolo has said that he has 13 and I've met 8 of Dorado's 10 kids. If each of those descendants had 5 or more kids, not including "divorces" and "remarriages" you've got the makings of a pretty large dynasty. When all of this is taken into account it's easy to understand that when you have a bunch of people claiming to be related to Django, they actually are. To complicate matters even more, many gypsy fathers are absent and raised by their mothers and therefore take there name. Django and Joseph are the perfect example of that, as are Dino & Francko Merhstein who are the sons of Sony Reinhardt who played on Tchavolo's and Mandino Reinhardt's records. To make matters more confusing, many gypsies use alias'. Yorgui Loeffler and Moreno Winterstein for example. Yorgui is actually a Weiss (and his first name isn't Yorgui) and "Moreno Winterstein" is not Moreno's name at all. Holzmanno Winterstein became Holzmanno Lagrene for the Bireli's Gypsy Project record. Baro Landauer (the first guitarist with Mondine Garcia at La Chope des Puces) was Niglo Adel on recordings. Lulu to my knowledge is a Reinhardt, but to what degree I don't know. Probably a cousin. In which way we'll probably never know as gypsies tend to keep that stuff close unless they like/trust the people asking questions. So, I hope this in some way explains how it all works. It's by no means set in stone, but these are the tendencies you see in the community at large. Wow, that's really interesting, Ted, and far more information than I had expected. Just out of curiosity, what is Yorgui's real name, and Moreno's also? "Django's first son Lousson had 15 children ..." Well, as Groucho once said about someone similar, "I like my cigar, but I take it out once in a while!" Oh, also, Maurice Ferret is cousin of Matelo, Baro and Sarane. The chart above is a good, but a very small start and omits a lot of people. As wrote above, it's exhaustive and I don't think possible to fully document everyone from every family.